CORNWALL Ontario – What does the Poppy mean to you as Remembrance Day approaches? Should we be remembering those who sacrificed their lives only one day per year? Many people have different thoughts about the Poppy which is used by the Legion to raise funds for our Veterans. Many return maimed, wounded, or mentally scared and have fallen through the cracks. The poppy to this writer is a sacred Canadian symbol, second only to our flag; yet to some it’s not. To some it’s “not a big thing”. To some it’s just this thing we buy and in some places respect isn’t given at all. The Legion has a trademark on the poppy and even has fought with the folks from the White Poppy movement. Here in Cornwall we have seen one of the worst defacements of our poppy ever; at least according to Bill Maxwell from the Legion’s own Poppy & Remembrance Committee. We first covered the story back on July 2nd of this year. It’s now November 1, nearly four months later and what has occurred has essentially been a sanctioned cover up. He was not sanctioned or even criticized by Mr. James “Jim” Brownell who is the Honourary Lt. Colonel of the Stormont, Dundas, and Glengarry Highlanders. A unit whose Colonel in Chief is Queen Elizabeth herself. Mr. Brownell in the image above is using a picture of himself in his Highlanders uniform as his profile picture. Mr. Brownell not only didn’t sanction the person who made the defacement; but championed him and is quoted. But isn’t that what our brave soldiers are? Aren’t they our keepers when this country is in need? Mr. Brownell was communicated to multiple times, respectfully and privately. He was asked if he was aware that he was in the group. He was asked if he was aware of the administrator and his past. He was shown the defacement of the poppy itself and corresponding entries. Our original story is still on his personal facebook wall as it was linked by another of his former students. There are two main questions to answer. Why did he take this position and two, why did so many refuse to call Mr. Brownell on this gross case of dereliction of duty and his refusal to condemn someone who defaced the poppy? Frankly the second question is more frightening than the first. I first asked Mr. Brownell if he actually joined the hate group on July 3, 2014. I did not join a hate group, and, quite frankly, it’s none of your business what I do. You are listed as a member there. The founder of this group, and several members are being sued by us for Defamation. It was originally a boycott CFN group which was taken down by facebook for hate symbols. The founder simply started up a new group the next day. I am simply seeking confirmation of whether you are choosing to belong to this group or not. You are still a public figure and there is a news story coming out on the group today as they desecrated the poppy among some of their other antics. The photo attached is of its founder and chief administrator, one Kevin Dockery. This was a courtesy email to you, and I have no idea why your response would seem to be so aggressive. You have every right to belong to a hate group if you wish I guess; even if you are using the photo I took of you to do so. I do not belong to a hate group, so there is no news here. Just now getting back on the internet, after technical troubles, and I can tell you that I have never seen anything related to the x-files, or whatever that might be. So leave me alone. I have been a friend with Kevin Dockery for many years, and I certainly have no regrets. He was a fine student. If the photo shows him in a state, other than that of a student, then so be it! Both you and I have probably been there, before. Please leave us all alone, and quit using references to us on your blog, or in the South Stormont News. I do have big shoulders, so can handle it, but just take a hike! 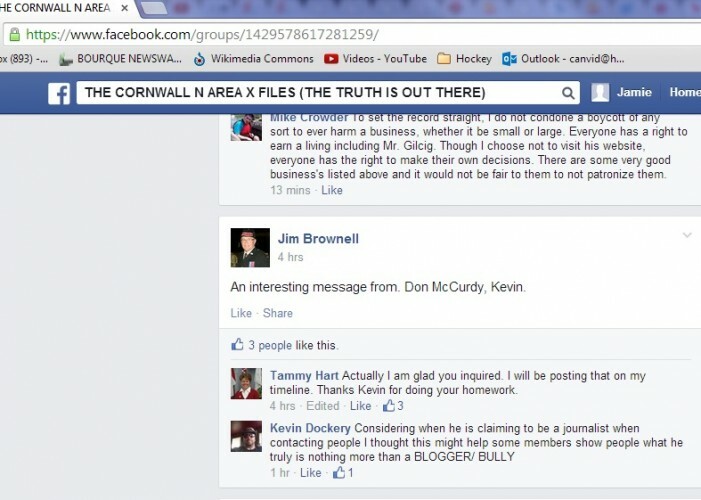 Jim Kevin formed a boycott facebook group. It was taken down for being a hate group. He simply restarted it the next day. Same people, same attacks against myself, CFN, SSN, and then council and Mayor McGillis in South Stormont as well as a few other lucky people like another one of your students, Debbie Cameron. It’s been sanctioned by Tammy Hart and her supporters. Your name appeared as as member which is why I emailed to confirm whether you chose to support this group by being a member. I’m totally bewildered by your stream of emails today as I have said nothing disrespectful to you and am simply trying to do my job and confirm information. Your name being in that group tacitly gives them your support which influences others. Here are some of their posts via screen captures from the group’s page which as of this email you were still a member of. I have no idea why my name gets associated with many things, but I don’t get too concerned about it. I know nothing about a hate group, nor do I belong to a hate group. I have no idea why this is of a concern to you. You have commented about x-files, but I have no idea what you are talking about. I have more important things to do in my life, so will sign off. You should find better things to do, too, rather than attacking every person who has ever tried to improve our communities. Leave us alone! It was a bewildering back and forth with Mr. Brownell making like he didn’t anything about the group that he was actively posting in. I had asked Mr. Brownell, if he was going to post in this group, to not use his profile pic that I had allowed him to use while at Queen’s Park. He replaced it with one of him in his uniform. Just wanted you to know that my posts are now without a photo. 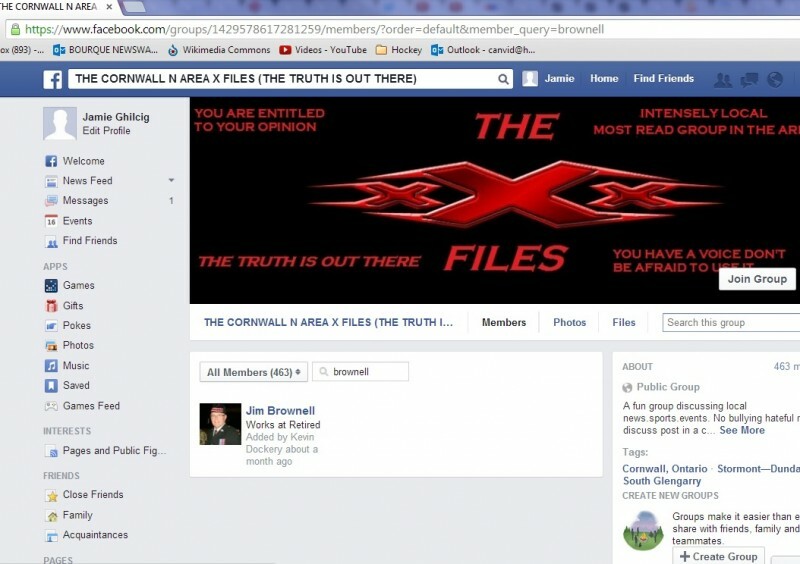 Unfortunately, Cornwall’s BLOGGER had Facebook remove it, as he took the photograph. My staff at Queen’s Park, in 2011, placed it as my profile photo, and I had used it since that time, as it was the only photo I had on the day that my Private Members’ Bill was debated and passed in the Legislature. 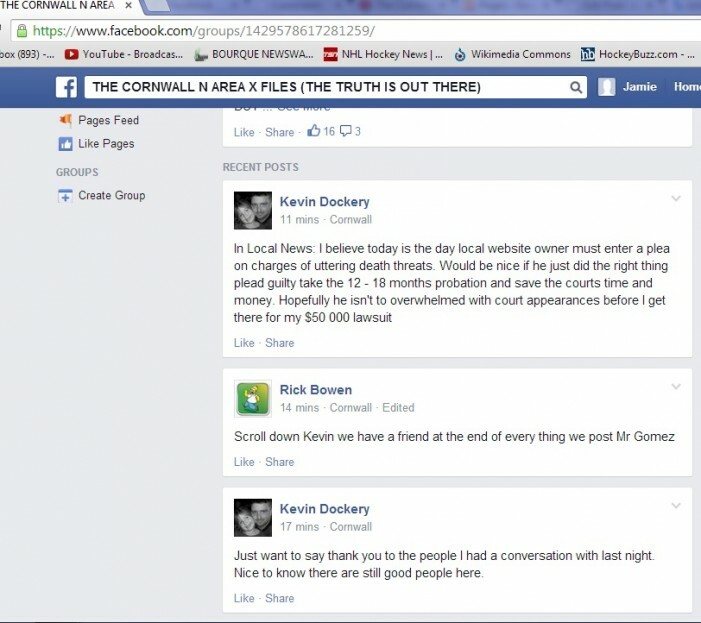 Apparently, Cornwall’s BLOGGER had taken the photo, and he has now asked that it be removed on Facebook. Unfortunately, I did not know how to remove it, so I guess I’m going to need assistance in getting a new photo with my posts. Cornwall’s BLOGGER can take the photo and shove it where the sun doesn’t shine! To my Facebook friends, I’m sorry for being so blunt, but Cornwall’s BLOGGER is way over the top. In July a Captain of the unit with a personal relationship to Mr. Brownell was shown the poppy image and some of our communication. He was shocked and in disbelief. Instead of condemning Mr. Brownell though he stopped communicating with myself. Shortly after that the group went underground into a secret mode. Most indicting was Mr. Brownell’s comment when he clearly stated that he felt no guilt regarding the Poppy defacement. I am not my brother’s keeper, but I can still be a friend with my brother, even if I do not believe in or agree with comments from my brother. The same goes for my friend. I don’t abandon family or friends, just because they write or say something I don’t agree with. So stay out of my life, and don’t try to make me feel guilty, because I DON’T FEEL GUILTY, IN ANY WAY! One of the group members also posted this gem. Omg someone altered a picture of a poppy on the internet better call a local news source! What a joke! But I do know what im doing when I get home! Altering a few more! Jim do you have any comment for publication about your support for Mr. Dockery’s defacement of the Poppy, joking about his defacement of the poppy, and you wearing your honorary Glen’s uniform when posting in the X Files group? As I have not seen nor read about the defacement of a poppy, I have NO COMMENT. As I told you before, get out of my life, and get it through your skull that I AM NOT my brother’s keeper! I am a proud Legion member and a very proud Honourary Lieutenant-Colonel of the Stormont, Dundas, and Glengarry Highlanders. Jim I emailed you the actual image of the poppy defacement. It’s in our email trail. It’s in our official investigation. For the record here it is again with Mr. Dockery making a mockery about the defacement as well. Bob Noble is also listed as your Facebook friend. For someone that claims to not know how to use facebook you managed to pull yourself out of the SSN group; but chose to remain in the X Files hate group where the poppy defacement and mockery of the defacement took place by someone you consider a “good friend”. We have everything time stamped. I think you need to resign your honorary Colonel designation with the Glens immediately. You’ve made some very petty and ignorant choices sir out of your animosity towards myself and CFN. You have posted in the X Files hate group with your profile pic being you in your uniform of the Glens. We have over 20 emails of me sending you info and asking polite questions while you throw hissy fit answers back. You’ve Mike Crowdered yourself Jim. While people like Mr.Borer might be protecting you do you really think the public will? Most Canadians, including myself, consider a desecration of the Poppy the same as desecrating our Canadian Flag. You sir chose to continue to support Kevin Dockery who desecrated the Poppy and the made a joke about no poppies being hurt in the making of the desecrating image. You have one shot; today only, to be honorable for the first time since we asked you if you knowingly were part of this group. I honestly hope you do the right thing and save the community the embarrassment of having this come out fully. At this point CFN and our original writer on the subject had emailed or tried to contact various agencies right up to the Prime Minister’s office and Julian Fantino’s. Some even by fax. The image was sent; but people kept turtling. As November approached Ms Pankhurst wrote a letter to the editor rehashing some of what had occurred and I started to contact some of the people she’d reached out to. That actually has resulted in some action. MP Peter Stoffer was in particular disturbed with this story and we are awaiting a comment from him. In the meanwhile I sent an email to that Captain that had stopped communicating. I’d cc’d Mr. Brownell who sent out a reply the same day. The James he is addressing is the captain and not myself. I see that you were emailed, this morning, by Jamie Gilcig. I would like to respond to you regarding this issue of the poppy, and I’ve also copied our Commanding Officer and Gilcig. It seems that he wishes to run with a story that I support the defacement of the poppy, and, as you know, this is so far from the truth. First, let me say that I have been a friend with Kevin Dockery for many years, having had him as a student, many, many years ago. 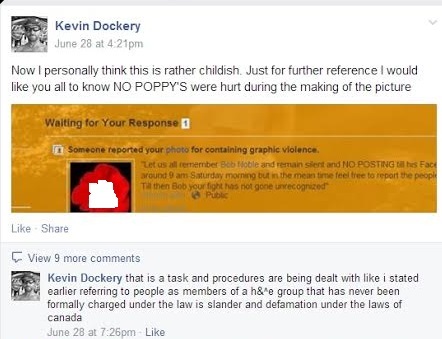 Apparently, Kevin Dockery had something posted to Facebook, with a flower and someone’s picture at the centre of the flower. Let me say that the flower doesn’t even look like a poppy, ‎but Gilcig is trying to blow this post to Facebook way out of proportion. As we all know, that’s how he operates. Because of my association and friendship with Kevin Dockery, and because I’m the Honourary Lieutenant Colonel of the Stormont, Dundas, and Glengarry Highlanders, Gilcig is trying to nail me as a supporter of the defacement of the poppy. This is so far from the truth! As I told Gilcig before, I am not my brother’s keeper, and I have no control over what my brother (or friends) say or do. As well, I do not abandon a friend just because of what he/she may say or do. To follow up on Gilcig’s accusation, I have always upheld the poppy as that great symbol of remembrance and respect, for those who made the ultimate sacrifice in war. ‎I know that my words to you, and copied to Gilcig, will be spun in a way that will reflect my disrespect for the poppy, but, with these words, let me set the record straight. These examples, below, should show to you and others, that I do, indeed, respect and honour the poppy as that great symbol of remembrance and respect for the sacrifices made by those in battle. When I went on the Stormont, Dundas, and Glengarry Highlanders’ Tour of the World War sites in Europe, in 2009, I returned to Canada with one souvenir, a poppy, crafted in metal, that I proudly wear on my lapel in November. This year, that poppy was affixed to my jacket a little earlier, in respect to the two soldiers who were so brutally taken from us. Is this disrespect for the poppy? I don’t think so!! With a visit to the Vimy Ridge Memorial being one of the most profound experiences of my life, during by European tour, I decided to commission an artist to paint me a piece, showing the Memorial, as well as having poppies being prominent in the masterpiece. Nathan Gowsell, a former student of mine, was the artist, and his masterpiece is my most cherished piece of art. Is this disrespect for the poppy? I don’t think so! After the Remembrance Day ceremonies, last year, I took the poppy from my tunic and place it on the sun visor of my car. It’s still there. Every day, during the past year, I’ve looked at that poppy, and recognized it’s symbolism. Is this disrespect for the poppy? I don’t think so! James, I am truly proud and honoured to be the Honourary Lieutenant Colonel of the Stormont, Dundas, and Glengarry Highlanders, but Gilcig will try everything in his power to disrespect this honour, bestowed on me, last year. ‎As I told him before, and as I’m telling you, now, I shall continue my friendship with Kevin Dockery, but I have no control over what he says or does. This is a free country, and freedom of speech is a cherished right. As I did last year, I’ll respectfully wear the uniform of the Glens during Remembrance Day ceremonies throughout Stormont, Dundas, and Glengarry, in 2014, whether Gilcig likes it or not. As I said at the outset, Gilcig will spin my words to suit his purpose, but I thought I would put my thoughts into written words, to you, James. ‎Perhaps I should have just left this alone, but I’m sick and tired of Gilcig’s efforts to disgrace or disrespect the successes of others in the community. I hope my words, expressed above, will set the record straight. I am happy to provide the entire email and communication trail as well as many screen captures involving this story which sadly Mr. Brownell is in fact spinning. In July of this year I asked Mr. Brownell to remove his facebook profile picture(which I took) as he was participating in a hate group directed at myself and my company. He had already confirmed his membership in the group. 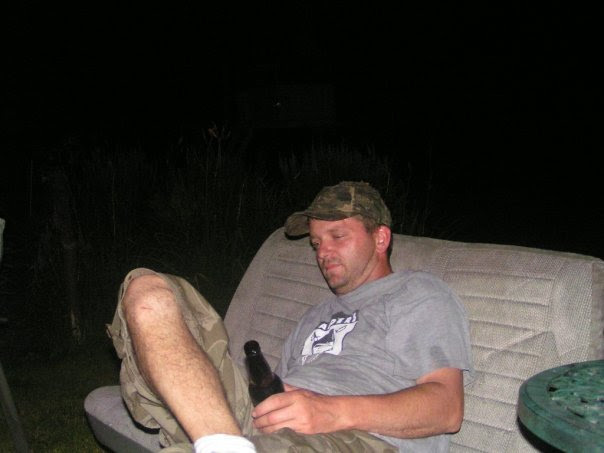 After facebook removed it (Mr. Brownell refused) he replaced it with the one of himself in the uniform from the Glens. Mr. Brownell was notified about the poppy being posted to the group after one of its members was suspended (including being sent the image. He was done so privately via email and not publicly shamed. He was addressed respectfully even though his replies were not. Captain Borer I also notified in August including being sent the offending image. I have not heard from him since. While I know he’s busy with his duties his light shows green in my gmail box frequently and he has stopped responding to my emails and calls. He was originally quite upset with Mr. Brownell’s actions as the documentation will show. Mr. Brownell has made his choice when presented with the image of the poppy and Mr. Dockery mocking complaints about the poppy in not only not standing up for what the poppy means, but actually supporting Mr. Dockery. The group subsequently went underground. I and many others at this point do not think Mr. Brownell has been honest or is fit to continue to wear the uniform of the Glens. He clearly has put his own personal animosity towards myself and my newspaper ahead of what the uniform and the sacred poppy represent. I am happy to share all of our communications and images for any investigation you wish to conduct. There is nothing hidden, no agenda, and frankly this is most disturbing seeing as I drove Captain Borer to a brewery that sponsored the St. Andrews Ball at the Amoury; an event that I was ultimately banned from. Mr. Brownell’s actions as sad as they are should not be covered up. They may be simple misjudgment; but the should not be allowed to go unnoticed or unsanctioned. If you don’t respect the poppy,then you don’t respect those who have given their lives for it, and to see Mr. Brownell post about Cpl Cirillo or think of him in uniform on Remembrance Day is not acceptable. My reply was cc’d to Mr. Stoffer, MP Ted Opitz, our PM, the Captain, and Stephen Young the CO of the Glens. It included the image of the defaced poppy. Mr. Brownell emailed again. Please note we have not edited any of the emails in this exchange. Mr. Brownell clicked REPLY TO ALL. I have never belonged to a hate group, and I don’t plan to do so in the future. I am not a hateful person, and I’m demanding that Gilcig stops the reference of me being a hater. I love my family, friends, community, and humanity in general. So Gilcig, stop the reference to me being a hater. As for having my photo on Facebook, as the HLCOL of the Glens, I am proud of my role with the Highlanders, and it’s not going to take Gilcig’s words to change that. I’ve had a long association with the Glens, and the photo of me can be used on my Facebook page, if I like. Presently, the photo is of me in my role as chair of the 2015 International Plowing Match and Rural Expo. As for spinning, it’s Gilcig who is spinning things to suit his twisted needs. As I said in my last email, I respect the poppy and have given examples of that, from recent years and right up to the present time. I am sure Gilcig will never publish these public examples of my respect for the poppy. Who does he think he is to question my wearing and respect for the poppy? I respect all who serve in the CD, and all who served in the past. Who is he to question my sincerity and respect for our soldiers and all who serve?? This guy is a joke! There are thousands of people who know that I’m an honest, hard-working HLCol, and I take my role and responsibilities seriously. I suspect that Gilcig will spin a story to suit his needs, and, at this point, I could care less. I’ve seen what he’s done to so many others in my community, and I an not interested in having anything to do with him. He calls himself a Gonzo journalist, but I have other words for him, that I can’t write in this message. Quite frankly, most others in the community feels the same way. To anyone that I’ve bothered with this email, my apology for disturbing you. I just wanted to set the record straight, although I know that most of you would understand the record. I’m proud of my record, as are my family and friends. For those who have ignored Gilcig, we’ll good for you. This will be my last email on this issue, and I’ll be ignoring him from now on, as well. I’m sure he’ll take bits and pieces of what I’ve written and, as said, spin them to his needs. I am including the following images; you in your uniform in the x files group (calling me a troll) which was started by Mr. Kevin Dockery the day after his first group (boycott cornwall free news) was taken down for anti-semetic hate symbols. 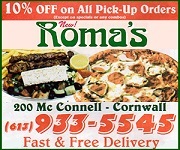 I am including that image as well from facebook. I am not spinning; but sadly sir it seems you are. Again, I am offering all of our correspondence for review at any time. Mr. Brownell don’t be like Jian Ghomeshi and keep digging the hole deeper. I’m sorry your dislike of my paper clouded your judgement; but sir I have been respectful in my communications to you. I am presenting facts, images, your own words. You just seem to be calling me names or suggest I’m spinning. Instead of defending the poppy and condemning Mr. Dockery you sir defended and championed him. I would even imagine that you might even still be a member of the group that is now underground but most likely still active. I literally have over 100 images of you in the group or interacting directly with Mr. Dockery. A convicted criminal over the brave men of The Glens and our Armed Forces across Canada. You sir have made an error. The honorable thing would be to resign. You have no place at any event on November 11th, 2014. And that is where we stand. It seems we have a man who put his own petty animosity against this writer and newspaper ahead of his duty and loyalty to the men and women of the Canadian Armed Forces and the unit to which he is an honorary Lt. Colonel. What’s more disturbing is that many are giving him a free pass on this issue. The Legion locally has yet to respond. The process has been daunting as November 11th approaches. What do you think CFN viewers? You can vote in our poll and post your comments below. I believie People like Mr.Brownell and Mr.Jim Luciani should embrace your articles Jamie or sue the hell out of you if they belivie you are lieing.But your to smart of a man to even think about writing lie,s and they all no that. I think many many people should br angry over this,but welcome to Cornwall. Should burning our national flag or desecrating national symbols like the poppy be illegal or should the rights of the minority that believe these actions are a form of free speech, be protected? When do the rights of inanimate objects or national symbols trump the rights of free thinking human beings? Marc a few people have noticed that generally when I write something like this I provide this funny thing called PROOF. A PROOF is what courts use to determine the TRUTH. And in this case the TRUTH is that because of Mr. Brownell’s animosity he has made choices that I’m sure he would not make if it involved another person. What next? Eating babies? It’s sad that someone at his age and with his legacy is digging his hole deeper and deeper. Just for the record sir, I removed myself from any site that’s involves a boycott. I just cannot understand why you feel the need to attack good people in our community. No Jim. The group’s simply changed their names. Should I post the screen caps? But the subject of this story is the cover up of Mr. Brownell’s supporting of the person that defaced the poppy and then mocked the defacement. I apologize for my comments. I will not post again. Jim a few simple questions. Do you support the Poppy? Do you support the defacement of the Poppy by Mr. Dockery? Do you support Mr. Brownell as Lt Col of the Glens supporting Mr. Dockery instead of the Poppy and all it stands for. Those should be easy enough for anyone exposed to what’s occurred to answer. Either we support our troops sacrifices and all that the Poppy stands for or we don’t. It’s not a popularity contest. Millions in our Nation are in agreement with you Mr. Gilcig!!! The Poppy is a sacred National symbol. When you tell the truth, you have nothing to fear! While defacing the poppy is considered a faux pas, what I find admirable about Jim Brownell is that he says “Damn the torpedoes” and stands up for his friend. I think we all need true friends like that. Mr. Munro based on your blatherings I’m sure voters will be as equally impressed with you next time around than they were this year. The public isn’t into those that ride their daddy’s coat tails. The poppy that we are familiar with is a copyrighted image/object owned by the Royal Canadian Legion. I don’t think it qualifies as a sacred object.